Here is everything you need to know about downloading and installing the AppleScripts from this site. Watch the short video or read the detailed step-by-step instructions and information below. iTunes 12.2 introduced a new "Share iTunes Library XML with other applications" setting in the "Advanced" tab of the Preferences panel [screenshot]. Make sure this setting is checkmarked before running any scripts. Some scripts may not work otherwise. I discuss this new setting below. The first time a script runs in Mojave, you will be asked to allow it to have access to iTunes. More on this new Mojave security feature is below. AppleScript is part of the Mac OS so there's nothing to install except the script you'll download. Scripts in the iTunes Script menu are listed like menu items. If you want an AppleScript for iTunes to be available for all user accounts on your machine you'll install it once in the "Scripts" folder located in your [startup disk]/Library/iTunes/ folder. This Library folder is often called the local Library folder. If there is no "Scripts" folder in the [startup disk]/Library/iTunes/ folder then create one. To make an AppleScript accessible for just a single user then you'll install it in the "Scripts" folder in that user's [username]/Library/iTunes/ folder. The user Library folder is hidden by default. One way to make it visible is to press and hold the Option key on your keyboard and select Go > Library from the Finder. (See this Macworld article describing how to keep the Library folder visible.) When the user Library is visible, navigate to the "iTunes" folder it contains. If there is no "Scripts" folder in the [username]/Library/iTunes/ folder then create one. • Clean installations of macOS 10.12 and later may not create the "iTunes" folder in either "Library" folder. I've written about this here. Under these circumstances, you may have to also manually create the intermediate "iTunes" folder. 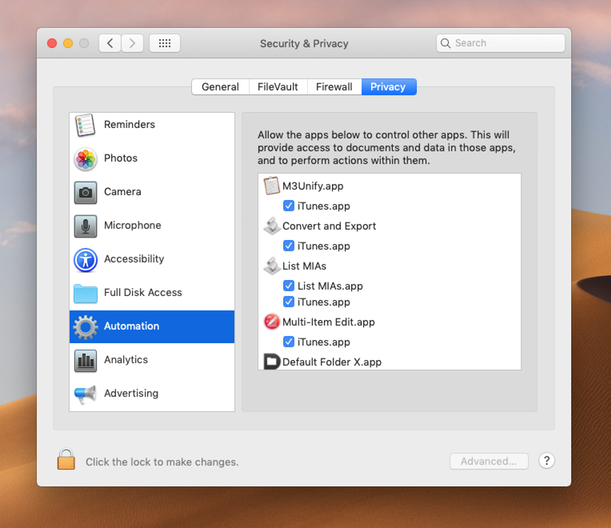 • In macOS 10.12, it may be that settings you have entered elsewhere prohibit using the Option key as the shortcut to reveal the Library item in the "Go" menu. If the Library folder does not display in the Finder's "Go" menu with the Option key pressed, try the Shift key (see this tip from Rob Griffiths). The single-user installation is what I've been recommending since 2002. But considering the user Library visibility issue in modern Apple operating systems, the all-users installation may be easier. Some users of security softwareIntego products, for examplehave reported that they cannot get the download link to work unless they temporarily turn the software off. The .zip files from this site have been encoded using the Finder's "Create Archive"/"Compress" command. Most modern browsers will automatically un-zip the filethat is, extract the archived file/folder it contains. (Safari will even move the .zip file to the Trash after its contents have been un-archived.) However, if this is not the case, you merely need to double-click the .zip file for it to un-archive. The disk image window when mounted and opened. To install the files/folders, drag the items from the disc image window to the "Scripts" folder you prepared (as described above). The .rtf/.rtfd file is the script's "Read Me" file and can be saved anywhere. But keeping it with the script in the "Scripts" folder is probably as good as any other location. Finally, close the disk image window and unmount it (press the arrow button to the right of its name in the Finder's sidebar). Mounted .dmg (Disk Image File) is displayed in the Finder's sidebar. Click the eject button to the right of its name to unmount it. You can backup the .dmg file, if that's what you do with your downloads. Otherwise, you can Trash it. This is a new layer of security which attempts to ensure that you are made aware when a script needs to access certain resources on your computer. In the case of scripts from this site, they will inform you that the script needs to interact with iTunes (and perhaps the Finder or other applications if so required). While this may seem self-evident (afterall, the name of this site is "Doug's AppleScripts for iTunes") it is certainly possible that a bad actor could convince you to launch a script that does not do what it says and instead does something else nefarious. If necessary, put a checkmark next to the app you want to allow access to in the script's entry. Or you can uncheck an app if you suspect the listed AppleScript is up to some funny business. A downloaded app (or script) that is not "trustworthy" enough will be prevented from launching, although it can ultimately be launched by right-clicking its icon in the Finder and selecting "Open" from the panel that appears. Most scripts from this site are codesigned with an authorized developer ID. However, many are not signed at all. Be sure to familiarize yourself with how Gatekeeper works so your downloaded scripts launch without issue. 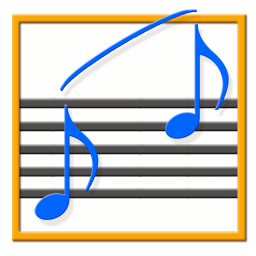 The iTunes XML file is periodically updated by iTunes and allows third-party applications to access track and playlist information. Many of my scripts and apps need to access this file or they will not work very well. So, unless you are aware of a specific performance issue or have been told to do otherwise, please, leave this setting checkmarked. According to this Apple support document, this setting is unchecked by default after installing iTunes 12.2 or later (such as you might during a clean install of the operating system). This is less of an issue as of 2015 since I now avoid using "System Events" in distributed software. As explained here, OS X 10.9 introduced an additional layer of security protection to prevent apps using the Accessibility API from having too much access. This specifically refers to an app or script using "System Events" to emulate button-presses, menu clicks, and other UI-related tasks. A small number of my scripts may oblige the system to ask your permission to control your machine. Inconveniently, this will happen when you first launch the script. It's best to click the "Open System Preferences" button in the alert and allow access. More details here. Some AppleScript files, such as applets and droplets, may not need to be installed in a "Scripts" folder. In these cases, you can install these AppleScripts wherever it is convenient to launch them or drag files to (in the case of droplets). A script's Read Me will have additional installation information. An older AppleScript on your modern Intel machine that looks like this onewith a circled-backslash over its iconwas compiled on a PPC machine. Click on "Save" in the File menu. If the extension you made a note of a moment ago is "scpt" or "scptd", set the "File Format" popup to "Script". If the extension is ".app" then set it to "Application". Make sure "Run Only", "Show Startup", and "Stay Open" are un-checked (in some rare cases a file with an .app extension may need to be "Stay Open"; check if the code contains a section that begins with "on idle"; if so, checkmark "Stay Open"). After the script has been saved on your machine's native platform, it will run correctly. In the name of the downloaded .dmg file (or in the name of the downloaded "ƒ" folder used before I switched-over to .dmg deliveries). Not for nothin', but I put a lot of time into creating the Read Me document for each scriptthe accompanying .rtf, .rtfd or .pdf documentso it is to your advantage to read it and keep it handy for future reference. I know how people feel about Reading the Freaking Manual (and I do try to make the scripts I write as intuitive to use as possible), but it's pretty silly not to. The Read Me is available to view as an online PDF in your browser in the "Info" section of its entry. Each script's Read Me is named using the name of the script so it will be easy to find in the iTunes Scripts folder after installing. The Read Me contains information on using the script and its version history. It also contains some embedded links to helpful information and my RSS feeds. Additionally, it also contains the URL to the script's entry at this site, should you wish to return to the entry to check for an update or to recommend the script to someone. I understand that I can't account for everyone's computer set-up. If you have any problems installing or using a script from this site, let me know. My contact info is in every Read Me. Otherwise, have fun!